The Royal Worcester porcelain factory is the oldest, continuously operating, english porcelain factory still in production today. 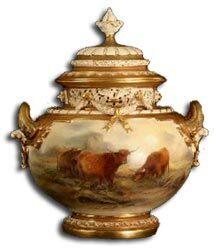 Here we look at Royal Worcester history, the Worcester marks, artists and porcelain wares. 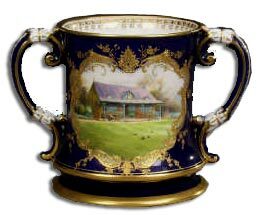 Royal Worcester was founded in Worcester, England in 1751. The first Royal Worcester factory was established on the banks of the River Severn by a group of local businessmen. It appears that around 1750 Dr John Wall (1708-1776) and the apothecary William Davis conducted some experiments at Davis’s shop in Broad street, Worcester. They discovered a method of making a porcelain material and then persuaded a group of 13 local businessmen to back their discovery with an investment in a new factory at Warmstry House. A lease for the grand house on the banks of the River Severn was taken out on 16th May 1751 and on the 4th June, the 15 partners signed a deed to officially establish the ‘Worcester Tonquin Manufacture’. The secret of porcelain production was to be the property of the shareholders and each agreed to a penalty of £4000 should they disclose knowledge of the secret to anyone. The original partnership deeds are still housed in the Worcester Museum. Early production was rather haphazard and the purchase of Benjamin Lund’s Bristol company was used to bring vital technical expertise into the mix. Worcester also obtained licences to mine soapstone in Cornwall and worcester soapstone porcelain did not crack when boiling water was poured into it; giving worcester a significant advantage over other producers. Hard paste porcelain is made of 2 ingredients-kaolin(clay) and petuntse(decomposed granite). European countries were unable to unlock the secret to the formula so they made their first porcelains by substituting different materials. Kaolin instead of soapstone, for instance. The soapstone made the porcelain withstand the heat of boiling water and produced tea services that were very much in demand. Worcester like meissen has always prided itself on its first rate quality. In 1789, Worcester received a royal warrant, and is still producing porcelain by appointment to Her Majesty Queen Elizabeth II. Meissen porcelain was greatly admired in England in the 1750’s, but its import was severly restricted and so English manufacturers imitated the meissen wares. By 1755 Worcester was making the best English blue and white porcelain tea wares that money could buy, as well as more expensive coloured enamel sets. It sold its porcelain through a warehouse in Aldersgate Street, London and from Samuel Bradley’s shop in Worcester High Street. 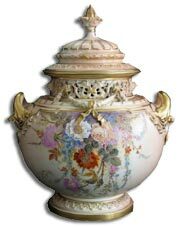 Worcester played a major role in the development of the English porcelain tradition, going through several name changes over the years and merging or taking over other manufacturers. Worcester are now known as Royal Worcester Porcelain Co. Increased tea consumption in the 1760’s created a huge demand for teawares, bringing prosperity to the Worcester factory. This didn’t last as competitors in staffordshire began producing inexpensive wares in large quantities. 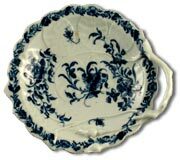 In 1774 Dr.John Wall retired and in 1775 Thomas Turner left Worcester and set up a rival factory at Caughley in Shropshire, where he mass produced blue & white tablewares in a very similar style to Worcester. In 1774 William Davis took control of the Worcester factory. When John Wall & William Davis died, the company was sold to Thomas Flight, who bought it for his sons Joseph & John and the name changed to Flight (1783-1792). When John Flight died and Martin Barr became a partner it changed to Flight & Barr (1792-1804) — then Barr, Flight & Barr (1804-1813) and Flight, Barr & Barr (1813-1840). Then to Chamberlain & Co (1840-1850) when Flight, Barr and their arch rival Chamberlain joined forces. In 1852 Irishmen, Richard William Binns (1819-1900) and William Henry Kerr (1823-1879) took over the management of the Chamberlain & Co. porcelain works in Severn Street, Worcester. The factory had been ravaged by fire and an extensive building programme took place in the 1850’s. Modern machinery was purchased and installed and new working methods improved the quality of the product. Kerr & Binns (1852-1862), gathered together an exceptionally talented team; including James Hadley, Josiah Davis and John Hopewell who started in 1852, and James Callowhill, Samuel Ranford, Luke Wells and Josiah Rushton in 1853. Then Thomas Callowhill in 1855, David Bates in 1858, and Thomas Brock and George Owen in 1859. In 1862 Kerr returned to his native Ireland and under the leadership of Richard Binns, with established new materials, new bodies & improved glazes and with properly trained staff the Worcester factory climbed to new heights of success. Alongside the name changes came different base marks including a “W”, a blue crescent, a fretted square, an anchor, imitation Chinese numbers, and a crown. At its height, the firm employed around 1,000 people, but after merging with Spode, and due to heavy competition production was switched to factories in Stoke and abroad. 100 staff were made redundant in 2003 and another 100 went in 2005. The last 15 pocelain painters left the Royal Worcester Severn Street factory on Friday 29 September 2006, together with another 100 workers. The remaining 200 employees are being retrained and the company has indicated its intention to focus on the production of ornamental giftware and prestige ranges. 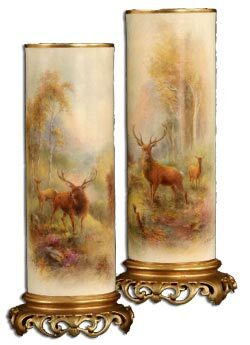 Good antique pieces and even relatively modern worcester porcelain items will become rarer and harder to find and the quality antique pieces in particular are a wise investment. The pair of stinton vases above right were sold in a local auction house in Yorkshire, England in mid-2006 and the auctioneers, using their vast experience and extensive knowledge, detailed in the auction cataloque, an estimnate of £2500 to £3000 for the pair … The pair sold, in the room, for just over £24,500, excluding commission. Tips on collecting antique Royal Worcester porcelain. Find and use good reference books that detail the numerous names and Worcester marks. Always carry one with you or make sure you have access to our Royal Worcester section. Focus your collecting on a specific period of Royal Worcester porcelain or on specific artists. 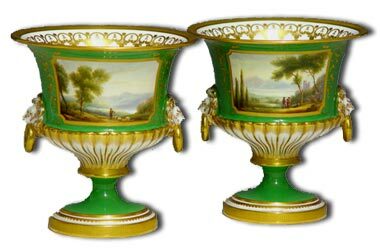 First period refers to pieces made until 1783 when Thomas Flight purchased the Co.
Royal Worcester refers to pieces from about 1862 onwards. Beware of imitations. Early worcester was soft-paste. If a piece claims to be early, but is hard-paste porcelain or bone china it’s a fake. Examine the motifs and decoration. The decoration on some pieces was painted much later than the original. Black spots or a black foot rim usually indicates a piece has been refired. Remember Royal Worcester produced a wide range of wares and they come in many different shapes and with many differnet motifs. Ensure you have fun collecting and make sure it is something you enjoy before you start spending. Summary of the complex ownership of the worcester porcelain company. 1751 — Dr.Wall and William Davis with 13 partners. 1776 — Dr.Wall dies, other partners continue to own the worcester company. 1783 — Thomas Flight buys the Warmstry Factory outright for £3000. 1804 — Factory now owned by Martin Barr Snr, Joseph Flight & Martin Barr Jnr. 1813 — Now owned by Joseph Flight, Martin Barr Jnr. & George Barr. 1840 — Flight,Barr & Barr merge with Chamberlains. Barr family retains a minor share. 1852 — Kerr & Binns established and production moved to the Chamberlain factory. 1862 — Worcester Royal Porcelain Co. formed. Edward Phillips major shareholder. 1930 — Harrison, Robinson & Col.Clive bought the company from the receivers. 1934 — C.W.Dyson Perrins buys the company. 1954 — The Worcester Royal Porcelain Co. goes public and is owned by sharehoders. 1978 — Royal Worcester fully owned by Royal Worcester Ltd.
1983 — Royal Worcester bought by Crystalate Ltd. Significant dates in Royal Worcester Porcelain history. 1751 — Dr Wall and 14 partners found the first worcester porcelain factory. 1752 — Rival business of Benjamin Lund in Bristol was purchased. 1754 — Worcester opens its first showroom in Aldersgate Street, London. 1756 — Worcester’s Robert Hancock invents printing on porcelain. 1767 — Worcester opens an exhibition room in Spring Gardens, Charing Cross. 1770 — Worcester produce a dinner service for George III’s brother, the Duke of Gloucester. First royal service. 1783 — Robert Chamberlain sets up a rival factory in Severn Street, Worcester. 1788 — King George III and Queen Charlotte attend the music meeting & visit Flights factory. 1788 — Flight opens the most prestigious shop at No.1 Coventry Street on the advice of King George III. 1789 — King George III awards Worcester its first Royal Warrant. 1802 — Admiral Nelson and Emma Hamilton visit Chamberlain’s factory and order a large service. 1851 — The Worcester Royal Porcelain Company managed by R W Binns and W H Kerr. 1860 — Prince Albert orders a dessert service for Queen Victoria, painted by Thomas Bott. 1878 — Royal Worcester display The Potter’s Vases at the Paris Exhibition. 1880 — The first piece of Royal Worcester Fruit painted by Octar Copson. 1914 — Government asks Royal Worcester to produce items for use in hospitals and schools. 1931 — Tableware is revolutionised by the introduction of fireproof porcelain. 1934 — Charles Dyson Perrins buys Royal Worcester and becomes Chairman. 1935 — George V and Queen Mary are the first limited edition figures made by Royal Worcester. 1936 — Dorothy Doughty designs the first in a series of over sixty models of American Birds. 1946 — The Dyson Perrins Museum Trust is founded to care for the museum collection. 1947 — Doris Lindner models a portrait of Princess Elizabeth on her horse, Tommy. 1951 — Princess Elizabeth visits the Royal Worcester factory and opens the new museum. 1954 — The Worcester Royal Porcelain Co. goes public. 1962 — Evesham designed by Prof. Robert Baker, R V Ruyckevelt & the worcester design team. 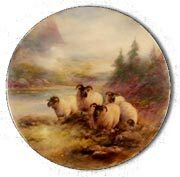 1976 — Royal Worcester and Spode merge.